It sat in my Steam library, untouched, for two weeks. Every day, I opened Steam, browsed for newly released titles, and then spent what felt like forever starting at the words. The optimistic blue button, encouraging me to "play," felt almost like a dare. Or perhaps a strange encouragement. "You can do this, it's just one click." That button is physically the same for all games, but felt so different this time. For two weeks, like a sadistic ritual, I would stare at that blue button, wondering if I was strong enough, this time, to click it. Today I was. This morning I kissed my girls goodbye and sent them on their ways to school. After brewing a cup of coffee, and then a backup cup, I sat down in front of my computer. I stared at the button for a minute. Five minutes. Ten minutes. Time stood still, but I finally did click it. Even before playing the game, even when just clicking the standard "play" button, I tried to be as delicate as possible. I knew what I was getting into, knew what my next few hours would be. Or at least, I thought I knew. Three and a half hours later, I was standing in the main office of my older daughter's school, apologizing to the receptionist for forgetting to inform them that she had a doctor's appointment and needed to leave early. There was no doctor's appointment. There was no appointment for my younger daughter, either. I just desperately needed them near me. I needed to hold them forever. While "fun" is typically the factor many use in order to determine the success of a video game, today I experienced an entirely new criteria. It was not fun. It was not enjoyable. That Dragon, Cancer is not a game for everyone. But, all those points considered, it is a profound, emotional, and dare I say important game. Shortly after his first birthday, Ryan and Amy Green's son, Joel, was diagnosed with an aggressive brain cancer. Over the next few years, Joel underwent rounds of chemotherapy and radiation, with the cancer fluctuating in strength, yet he surpassed everyone's expectations. Ryan began working on a game, a game that was meant to document his son's miraculous victory over cancer. But this, sadly, was not the path that reality paved. In March 2014, Joel passed away. That Dragon, Cancer, through its intimate and raw storytelling, invites you into Joel's short life, and his four year battle with cancer. That Dragon, Cancer is a game that was not written by its creators, rather it was written for them. That Dragon, Cancer consists of two different stories. The first is Joel's real life battle with cancer, his parents' relationship with him, and the world as it existed around him. It is doctor's offices and playgrounds. It is Joel's laughter and cries, and his parents' constant attempts to create a happy environment despite their own grief. The second story takes you into the imagination of a child who is struggling to make sense of things that even adults are unable to comprehend, to answer questions that have no answer, and to find a way to cope with struggles that no child should ever have to face. That Dragon, Cancer transitions from wonderlands of hopeful imagination to cruel reality. 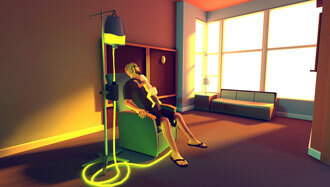 It might be more accurate to call That Dragon, Cancer an interactive eulogy than a "game." But that doesn't make it any less special - in fact, it shows the ways in which video games can be used as therapeutic devices, and it's difficult to miss the beauty in that. I am grateful that I was not tasked with the job of penning a traditional review for That Dragon, Cancer. It is truly an unreviewable game. How do you assign a numeric value or a number of stars to a person's lived experiences? How do you look at something like this, and say "your tragedy entertained me three stars worth?" How do you measure a game when the primary "mechanic" is raw, unapologetic, real tragedy? The pointing and clicking is shaky, the navigation inconsistent, and no, this is not a "fun" game. However, while these issues would typically result in the deduction of points in an official review, in That Dragon, Cancer it adds to the experience. It is a shaky, emotional game, and the sloppy controls feel oddly appropriate, even if they were accidental. In the same way that That Dragon, Cancer blends the fantastical with the tragic, the game had the same impact on me emotionally. I felt like an interloper and a confidante, a stranger and a friend. I participated, and I received. But more than anything, at the end I was struck with both gratitude that this story was shared with me, and a pang of guilt gripping my heart. Guilt, because my part of the story was over, and I was free to walk away. The single most heartbreaking part of That Dragon, Cancer is that you enter into the game knowing that no matter what you do, you will lose. That you may finish the game, but that you will not win the game. That Dragon, Cancer is a game with no extra lives, no respawns. 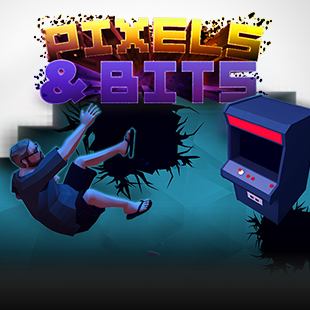 It is a game about hope and despair, of love and pain, of holding on and learning to let go.